Maria Parloa was widely known as a writer and lecturer on the art of Cookery and Household Economics. She lived from 1843-1909. And it could be argued that she was one of the first people to encourage home economics be taught in schools. Parloa wrote seven books, many articles, pamphlets and bulletins. She was a major contributor to Good Housekeeping and Ladies Home Journal. While today her name is one that lives in obscurity, during the turn of the century she was very well know. 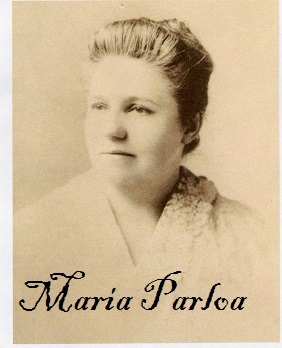 Parloa was an educator at heart and helped launch the career of Mary Lincoln who would become the educator of the famed cookbook author, Fanny Farmer. Unfortunately little is know about the early years of Maria Parloa, she was orphaned at a young age, likely worked as a domestic and made her way up through resort properties in southern and northern New Hampshire. Parloa went on to get educated and subsequently opened cooking schools in Boston and New York which ultimately led to her writing career. I have started this blog as a way to record my research which I began in the Fall of 2003. I'm not entirely sure where this knowledge will take me, but I have been fascinated by this most innovative, independent women, who seemingly forged a career out of little more than hard work and determination. My obsession began on a cold October afternoon, as I was combing my way through dusty antiquarian books in Boston with my now husband, Jonathan. I came across this brown embossed, gold trimmed title, Appledore, which immediately caught my attention because of my familiarity with Appledore Island (Isles of Shoals) off the coast of NH. I had been interested in food history and was intrigued by the idea of finding a local cookbook. I looked at it for a good long time, but knew that the $100 price tag was out of my league. So back on the shelf the book went and by chance one week later I would have another encounter that would bring me back to Maria Parloa and the Appledore cookbook. Could you tell me the source for the photo of Maria Parloa? Thanks for this blog. It appears the BCS may have taken some of her business, since she closed her Boston school a few years after BCS opened nearby. I wonder if there is more to that story. Hope you'll enjoy other days as well. 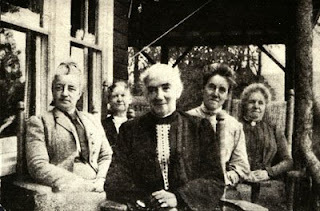 Thank you for your blog on Miss Parloa. I am a big fan of her having also lived in Portsmouth, was the chef on Appledore Island and now live in London, England as a chef. I recently purchased a writing by her on ebay and like you hope to find more about her early years. Thanks again for this most informative blog. Finally getting back to this blog. Great to hear from you Matt. Let me know that next time you come back to the Seacoast and we can have coffee and chat for hours on the topic.